Centuries of violence underlie the civil war that has so far killed over a hundred thousand Syrians, driven out two million refugees, and displaced six and a half million internally, and it is just part of a war where we and other powers are fighting for our own conflicting aims. 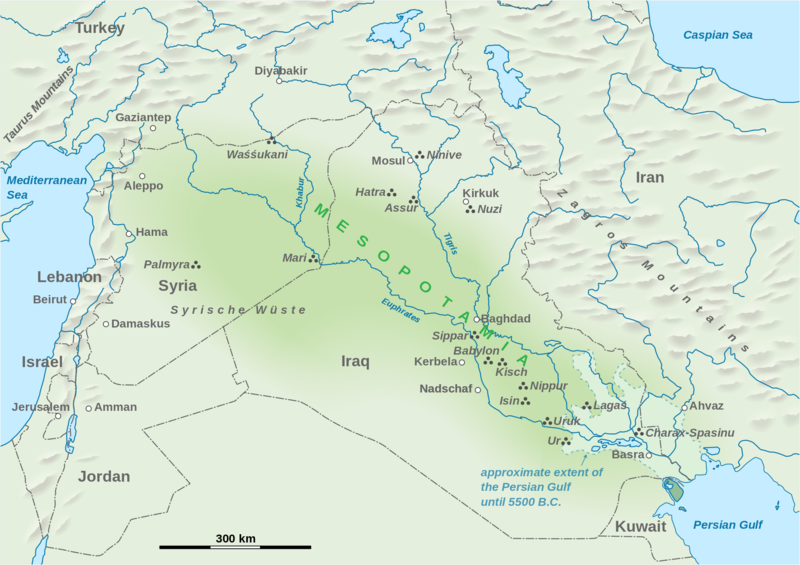 Syria is where agriculture and cattle breeding began in Mesopotamia around 10,000 BC. It has been under empires of Iraq, Iran, Egypt, Greece, Rome and Turkey. It was held a thousand years ago by French, English, Italian and German Crusaders. After WW1 when Iraq was taken by the British, it fell under France. Britain later offered not to establish a Jewish state in Palestine in return for hegemony over a Greater Syrian state but France retained control until 1946. Independent Syria made a chaotic start and was stable for only forty years. Syria’s population includes Arabs, Greeks, Kurds, Turks and others. Roughly three quarters of Syrians are Sunni Muslims, including Kurds who make up 9% of the overall population. Shia Alawites (12%) and Christians (10%) make up the rest along with small numbers of Druze and others. 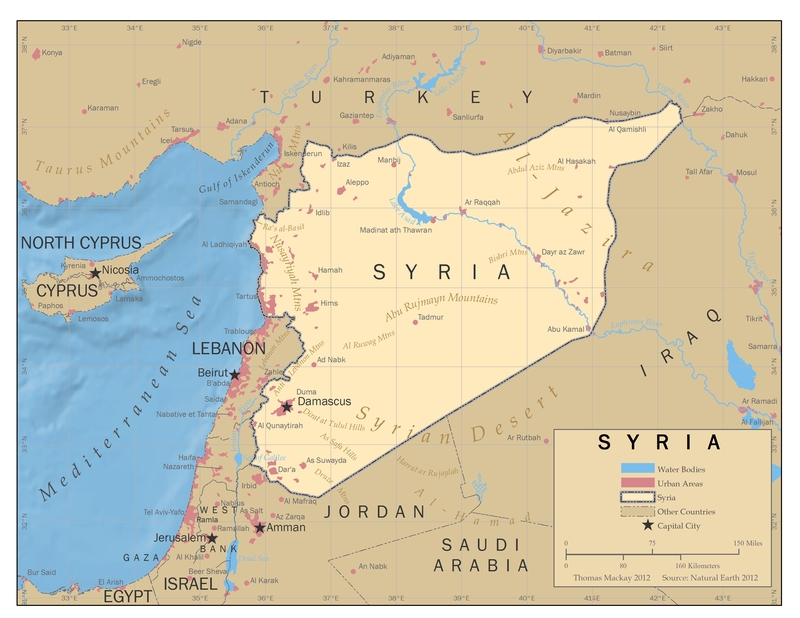 Although Sunni Arabs are by far the majority, Syria is ruled by Shia Alawites from the narrow coastal region that is separated by a mountain range from a semiarid steppe zone that covers three-quarters of the country and which is bisected by the Euphrates valley where cereals and cotton thrive. The east is desert. In the extreme northeast there is oil and natural gas. Newly independent Syria had military coups, twenty different cabinets and four constitutions in its first decade. Martial law was in place for more than half a century after Israeli, British and French forces invaded Egypt in 1956 to regain the Suez Canal. Syria signed a pact with the USSR when they were forced to withdraw then united with socialist pan-Arab Egypt from 1958-61. The Arab Republic of Syria came into being in 1963 in a Ba’ath Party coup emulating one just before that in Iraq. The Ba’ath Party was established in 1947 by a Christian, a Sunni Muslim and an Alawite Shia Muslim, anti-imperialists who aimed to replace religion with socialism and social reform. In 1966 traditional Ba’athists were overthrown by Alawite army leaders. In 1970, air force leader Hafez al-Assad seized control and ruled Syria as a strongman until his death in 2000. He was succeeded by the present ruler, his son Bashar al-Assad. In 1967 Syria lost half the Golan Heights when Israel also captured Egypt’s Sinai Peninsula. 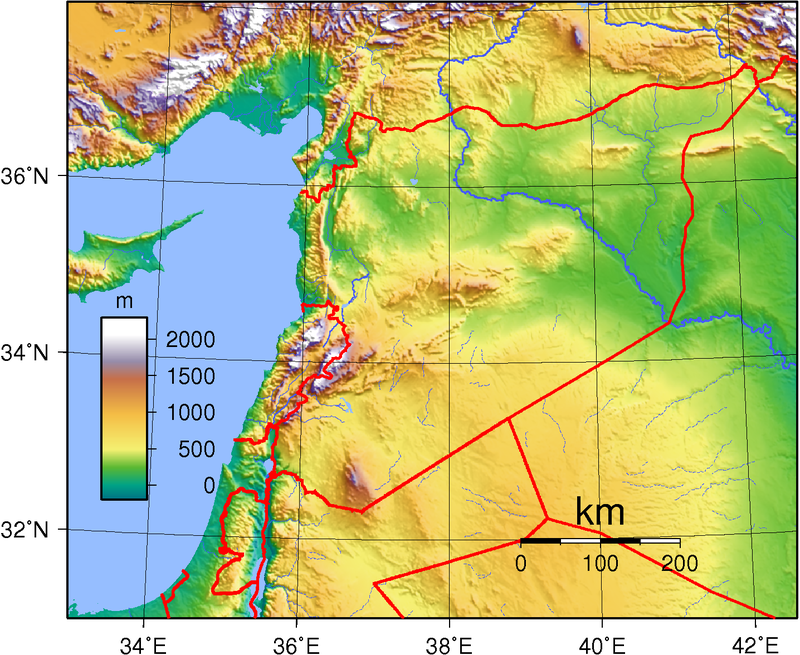 After losing more of the Golan Heights in 1973 when Syria and Egypt invaded Israel, Syria entered Lebanon in 1976 and remained there until 2005 supporting proxies like Hezbollah to prevent Israel from taking southern Lebanon. 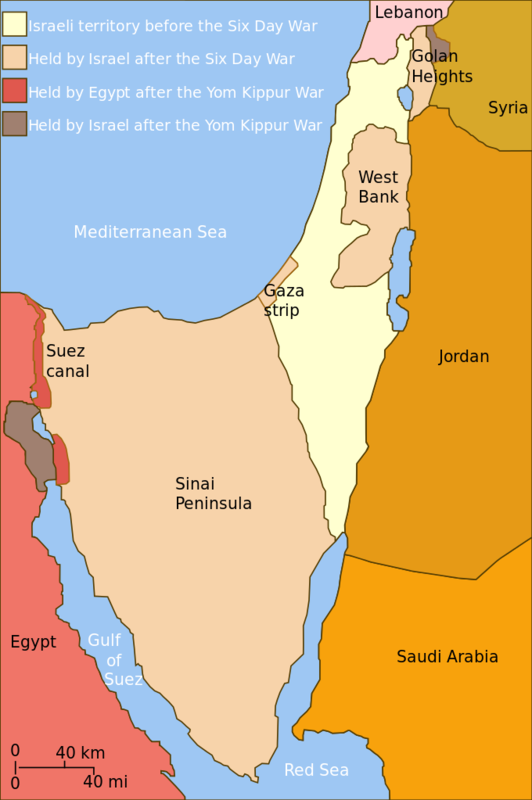 Israel withdrew from the Sinai Peninsula in 1982. 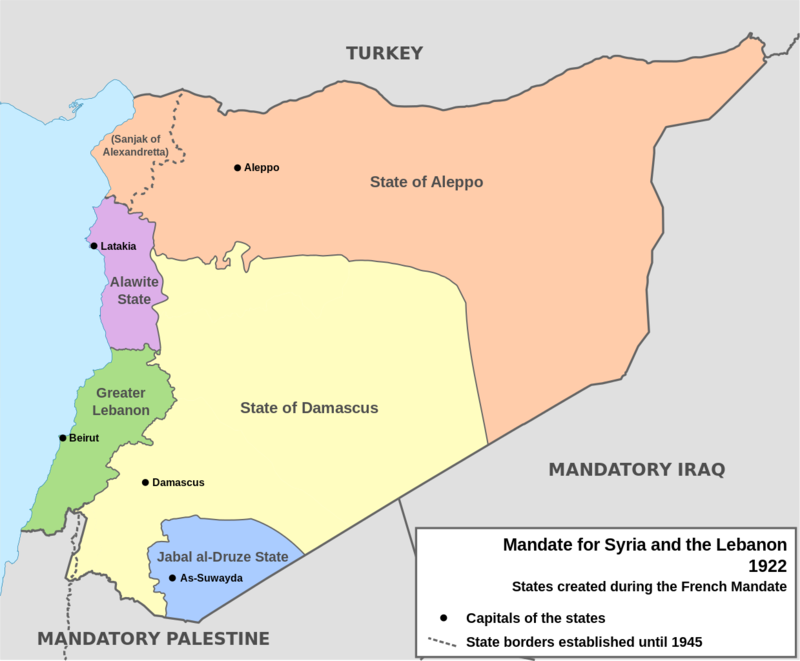 Syria’s current Ba’athist Alawite regime is based in what was an Alawite State when Syria was ruled by France. Under the Ottomans, the head of each ethno-religious group — Arab Shia, Arab Sunni, Greek Christian, Assyrian Christian, etc — administered the laws of his community. 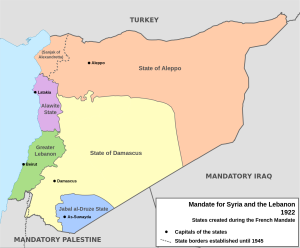 France defined Lebanon’s borders to put Sunni Muslims under Christians who were allied with France, and divided Syria into the State of Damascus at the heartland of the Sunni Arab majority, the State of Aleppo at the trading center of Kurds, Arab Christians, Armenians, and others who felt closer to Baghdad than Damascus, and the Druze and Alawite States where people are “sort of” Shia. Alawites celebrate many Christian festivals, use bread and wine in their ceremonies, and believe they originated as divine light but were cast out of heaven for disobedience and must expiate their sin over many lifetimes. Their God has three emanations that manifest in human form, most recently as father of the Shia faith, Ali, the prophet Muhammed and Salman the Persian who was born into a Zoroastrian priestly family, converted to Christianity, heard of the coming of another prophet and found Muhammed. Salman was the first Persian convert to Islam and the first translator of the Quran. For political reasons, the Alawites have been recognized as true Shias by Iran’s supreme leader. Our media said nothing about the issues, just demonized Bashar al-Assad, the same playbook they used for Nicaragua’s Ortega, Panama’s Noriega and Iraq’s Saddam Hussein. But just as there was no evidence for the “weapons of mass destruction” President Bush used to justify invading Iraq, there is no evidence that al-Assad’s regime was responsible for the sarin gas atrocity or has any weapons of mass destruction. We did supply sarin gas that Saddam Hussein used on Iraq’s Kurds, but the gas used in Syria was not weapons-grade. It appears to have been used by rebels who hoped to provoke us into helping them topple al-Assad’s government. 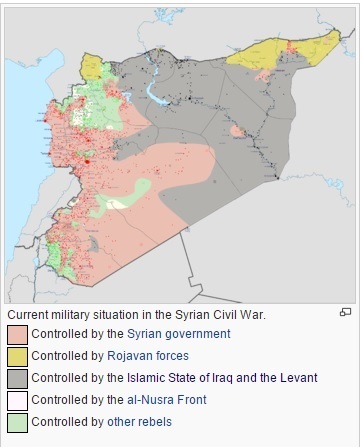 Now, four years into the civil war, Syria looks much as it did under the French Mandate except that the government still at this time controls a large part of what was the State of Damascus as well as the Alawite and Druze States. Most of what was the State of Aleppo is now controlled by the Islamic State while the northeast is held by Rojavan forces. The Rojavan, aka Western Kurdistan, manifesto says: “The democratic confederalism of Kurdistan is not a State system, it is the democratic system of a people without a State… It takes its power from the people.” Kurds want Kurdistan to include parts of Turkey, Iraq and Iran, too. Kurds following Ottoman policy in the early 20th century massacred Christians throughout that area and were rewarded with their land. More than half Syria’s poor are of Kurdish origin. The Islamic State of Iraq and the Levant (ISIL) which controls territory in Iraq as well as Syria began operating under a different name in Jordan in 1999. When we invaded Iraq in 2003 they attacked our forces, made suicide attacks on civilan targets and beheaded hostages. They pledged allegiance to al-Qaeda in 2004 with the intent: “to free Iraq’s Sunnis from Shia and foreign oppression, and to further the name of Allah and restore Islam to glory.” Early in 2014 al-Queda disavowed loose-cannon ISIL. The al-Nusra Front is an al-Queda branch formed in Syria and Lebanon in 2012 that aims to overthrow the al-Assad government and replace it with a fundamentalist Sunni state. They are focused on that alone and have warned against Western intervention. ISIL announced its merger with al-Nusra in mid-2013 but fighting broke out between them a year later. 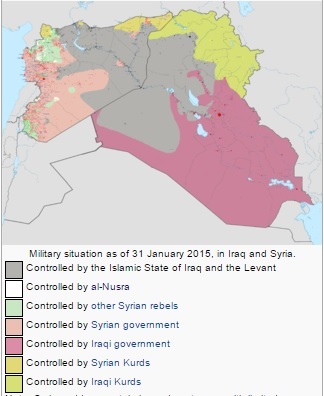 ISIL now controls much of Syria and Iraq while Syrian and Iraqi Kurds dominate the northeast. I will delve deeper into Iraq, Kurdistan and the Islamic State which in mid-2014 claimed religious, political and military authority over all Muslims worldwide. So… our air strikes are now leading the battle against the Islamic State, but we destroyed Saddam Hussein’s secular Ba’athist regime in Iraq and say we will also end Bashar al-Assad’s in Syria, which clears the path toward a fundamentalist Sunni regime like the Islamic State. Does what we’re doing make sense? Our military can destroy, but will we like what comes next? This 1993 article by Robert Kaplan is excellent.